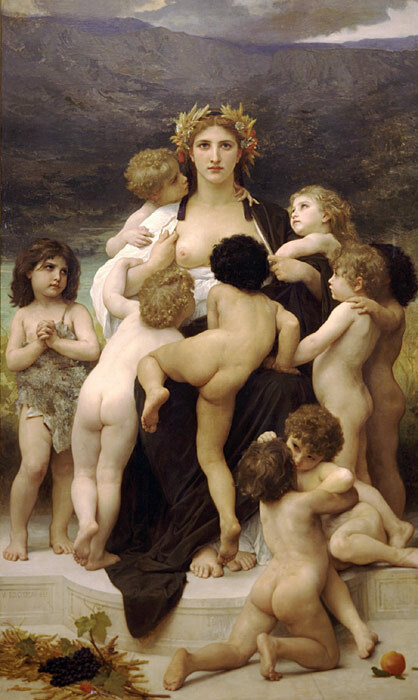 A century ago Bouguereau ranked among the most highly acclaimed artists in Paris. With the radical development of impressionism, his style quickly fell out of favor. It was deemed by most to be too sentimental and contrived, and his handling of paint was characterized as overly finished. The Motherland 1883 by Bouguereau, offers a light interpretation of an allegorical subject invested with a sensuality and carnality that would have appealed to the general audiences. SPECIAL NOTE : The painter will make the reproduction as close to the original oil painting as possible. If you want your painting to alter from this likeness, please email us and " Alma Parens [L'Ame parentale (The Motherland), 1883 " will be reproduced according to your special requirements.